Vijayanagara, Jan 6 (PTI) World Championship bronze medallist Assam's Lovlina Borgohain claimed the gold medal while Haryana boxer Manisha Moun had to be content with silver at the women's National Boxing Championships here Sunday. Manisha went down to Meenakumari Devi of All India Police in 54 kg class, leaving Haryana to be satisfied with three gold medals through the reliable Pinki Rani Jangra (51kg), Neeraj (60kg) and Pooja Rani (81kg), despite six of their boxers entering the finals. This meant both Haryana and the Railways shared six out of the 10 gold medals on offer on the final day with Sonia Lather (57kg), Neetu (75kg) and Seema Poonia (+81kg), as the three RSPB pugilists reached the top place on the podium. Punjab earned two through Manju Rani (48kg) and Simranjit Kaur while the other gold in 69 kg went to World Championships medallist, Lovlina Borgohain of Assam. Manju Rani had no difficulty as she stopped Tamil Nadu's S Kalaivani with a split (4:1) verdict in the final as the Punjab boxer packed more than a few punches to stagger her rival. In the Flyweight category, Pinki Rani was the favourite for the gold but her Telangana opponent Nikhat Zareen took the initiative and opened with few lefts and sent down some combination punches. Pinki steadied herself with good counters but there was no let up from Nikhat who continued to trade blows but in the final analysis, Pinki landed more punches on target areas which gave the judges verdict 3:2 in her favour. There were two other bouts in the middleweight (75 kg) and heavy (+81kg) which attracted the attention of spectators as Railways' Neetu defeated Haryana's Nupur and Seema Poonia, who scrapped through against Kavita Chahal of AIP, getting 3:2 decision. Both Neetu and Seema were passive to begin with before upping the ante towards the close of second and third rounds even as they kept their opponents -- Nupur and Kavita -- engaged even while the eventual silver medal winners did make serious attempts with good number exchanges of counters. Experienced pugilist, Sonia Lather did not have to go full blast against Shashi, who failed to produce the form of her semifinal bout and went down tamely as the Railways pugilist won 5:0. 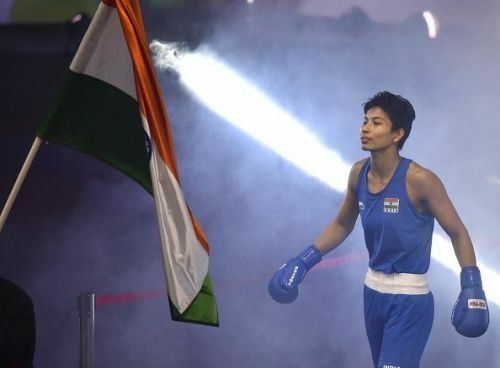 Others who won their bouts on points (5:0) included Neeraj of Haryana, who beat Preeti Beniwal of AIP, Simranjit Kaur, the silver medal winner at the worlds, from Punjab she beat Pwilao Basumatary of AIP and Lovlina Borgohain, also a medal winner at the New Delhi worlds, beat Railways Pooja without having to sweat it out much.